So you’re pregnant, and you might be wondering how to have a natural birth. 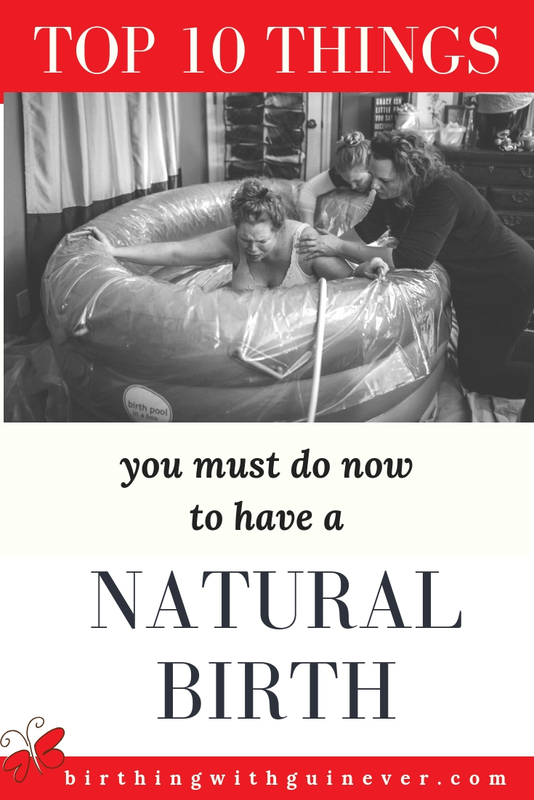 Having helped many women have natural births in my role as a doula and having birthed 5 babies naturally myself, I’d like to offer what I feel are a few of the most important things to do in order to achieve a drug-free birth. This article contains affiliate links which means if you click on a link and make a purchase, I may receive a small commission at no extra cost to you. 1. Going natural is a mindset. Make the commitment during pregnancy that drugs are not an option for labor. Believe that you can do it, and you will. If you have the feeling that you’d like to try it to see how it goes, but you’re open to getting an epidural, I guarantee you that you will have the epidural. Labor is hard work and to get through it, you can’t be wishy-washy going into it. One medical intervention leads to another. 2. 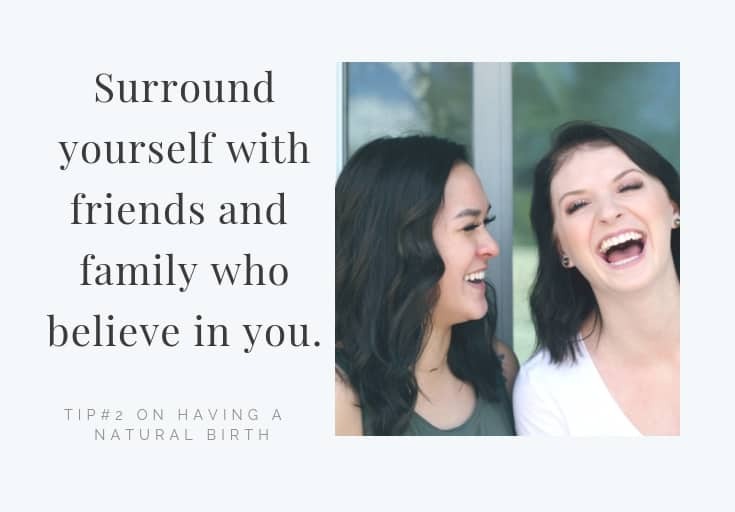 Surround yourself with friends and family who believe that you can have a natural birth, who assume that you can do it. Tune out the negative birth stories that some girlfriends might tell you about how awful labor was until the epidural took effect. Instead, seek out labor stories from women who have had a natural birth and you’ll hear how awesome the birth was, how the baby latched on right away, how the nurses kept making comments that the baby was so alert. You’ll hear how proud her husband was, what a great help to her he was during labor, and that the birth was an empowering, amazing experience. 3. Take a private, independent childbirth class. (in other words, don’t take the birthing classes offered by the hospital.) If this isn’t possible because you don’t have any in your area or you don’t have the time, take an online course like this one. Prepare yourself by reading several pregnancy books and learning labor coping techniques. Here is my list of recommended books. You want to find someone with a low induction, low cesarean, low episiotomy (and low tear) rate. Don’t be afraid to switch doctors or hospitals no matter how late it is in your pregnancy. Remember, it is your birth, and you are hiring them to work for you. There should be a mutual respect. 5. During labor, just take one contraction at a time. Don’t worry about the length of labor–how long it has been or how much longer it might be. Women talk about their long labors, but remember, it’s not as if they were in constant pain for 18 hours. Contractions only last for about a minute (longer during later labor) and you get breaks in between. Don’t let anyone tell you that your body isn’t working if your labor slows down. That is just the body’s way of giving you a rest. Be thankful for the break because labor will pick up soon enough. 6. Stay home as long as possible once labor starts. Nothing slows down labor as much as going to the hospital too soon. The longer you’re in the hospital, the more tired you will become. The longer you’re there, the more time hospital staff will ask you if you want pain relief. 7. Don’t be induced unless medically necessary. About half of all inductions done on first-time mothers result in cesarean birth. This is because inductions are done too soon before mom and baby are ready for labor. Read think twice, no think three times before being induced for labor. 8. Hire a doula. If you’re wondering what a labor support professional does and how a doula can help you, read what is a doula and should I have one? If a doula isn’t in your budget or maybe you don’t have any doulas in your area, I really recommend an online class made especially for husbands and other support people. It’s only 2 hours and is awesome. Actually, even if you do have a doula, you should still check out this new convenient online class. 9. Consider having a homebirth or going to a birth center. 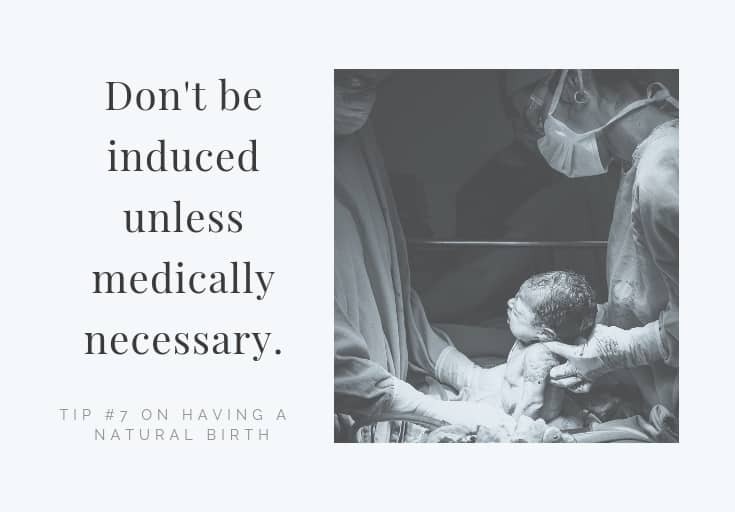 It’s so much easier to have a natural birth when you’re not in the hospital. When you’re at home, you won’t have hospital staff constantly asking you if you want pain medication. Getting an epidural at home isn’t an option, lol. 10. Read birth stories. Learn from the experience and successes of others. Be inspired by women’s birth stories. 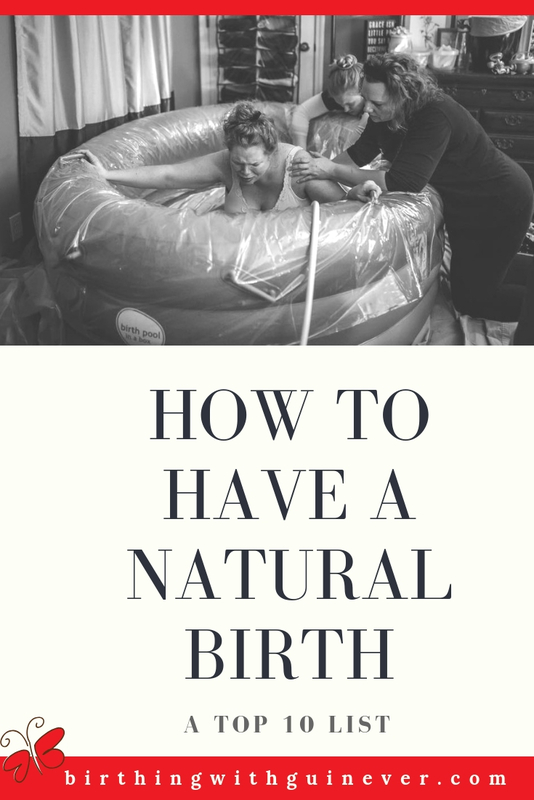 One of the best source of birth stories is Ina May’s Guide to Natural Childbirth. Birth is a natural process and women have been birthing babies for thousands of years. You can do it too. During labor, as long as you are doing alright and the baby is alright, there’s no reason to intervene in the process if you don’t want to.